Slender Man (2018 Movie) Review: Plot as slender as the man – AiPT! 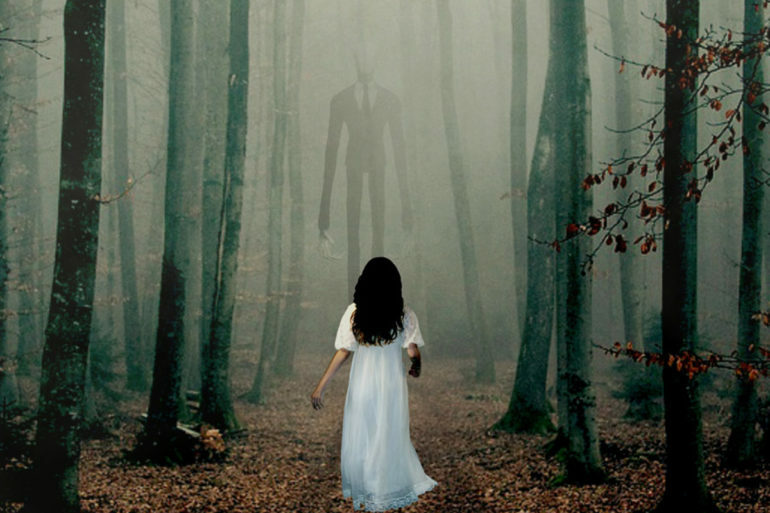 Slender Man, the popular Creepypasta character turned attempted child murder case turned summer film, centers around an antagonist whose narrow physique is only matched by the film’s thin plot. The synopsis for the latest incarnation of Slender Man sounds simple enough. Four small-town teens perform a ritual they largely believed to be a joke, evil is unleashed, and terror ensues. While this tried and true formula worked fine for genre classics such as Sam Raimi’s The Evil Dead or Bob Clark’s Children Shouldn’t Play with Dead Things, here it is more of a cheap crib off The Ring wherein our quartet of doomed youths, led by actress Joey King of The Conjuring fame, watch a weirdly edited online video, marking their respective fates. After group bestie Katie goes missing, Haillee (Julia Goldani Telles of Showtime’s The Affair) and her schoolmates from high school desperately search for their friend, as well as answers, before the eponymous entity ensnares our troupe of teens in his ever enclosing, ever entangling, ever computer animated appendages. Director Sylvain White, whose horror cred includes the straight to video sequel I’ll Always Know What You Did Last Summer and an episode of the now canceled Sleepy Hollow television show, brings nothing particularly new to the table. Instead, the audience is presented what is largely a pastiche of tired horror trends, Frankensteined together into a feature film, and dumped into August as chum for bigger films such as The Meg which is opening the same weekend. Slender Man, the popular Creepypasta character turned attempted child murder case turned end of summer film, centers around an antagonist whose narrow physique is only matched by the film’s thin plot. Who could have predicted the influence that the Silence from Doctor Who, the Gentlemen from Buffy the Vampire Slayer and Jack Skellington of A Nightmare Before Christmas wound have collectively on this generation’s youth? Though I routinely decry PG-13 horror cinema, in this case it half makes sense. Why restrict the only demographic (sheltered/impressionable post-millennials) that might actually find the title character scary? The film is replete with pointless Elm Street inspired dream sequences, a meandering story and a third act reveal that goes nowhere. While perhaps not as bad as the absolute dregs horror fans have been subjected to in recent years (e.g. The Bye Bye Man, Truth or Dare), Slender Man firmly positions itself amongst forgettable mediocrity such as The Forest or The Boy and will undoubtedly be dwarfed by forthcoming, greater anticipated, horror releases such as Halloween and Susperia. Suffice to say, this iteration of Slender Man will garner no new slender fans. Slender Man, the popular Creepypasta character turned attempted child murder case turned summer film, centers around an antagonist whose narrow physique is only matched by the films thin plot. The films features some better than average performances from its young cast. The forest exterior shots are credible/well lit. The titular villain is tired and uninteresting with unclear motives and no sense of true menace. The film’s setups fail to payoff in interesting ways. Cheap attempts at scares fall flat.